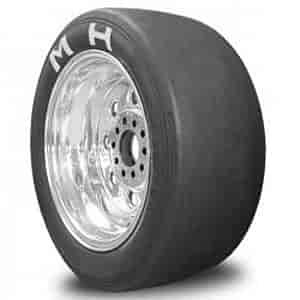 M&H Racemaster Drag Slicks 26.0" x 6.0" - 15"
HB-11 Compound: Drag Racing Slick, Tube type. Not D.O.T. Certified. Extreme traction material. Smaller sizes primarily for FWD race cars but can be used with AWD or RWD. Race cars of 3500-pounds or less will find this compound very effective. Light or moderate burnout recommended. M&H Racemaster drag racing slicks have been around since the early 1950s and, like drag racing itself, they keep getting better with age. Refined tire design and new compund technologies have brought Racemaster to the front of the pack. Sink your claws into the asphalt and put the power to the ground with their drag slicks or DOT-certified wrinkle wall tire featuring a performance tread and drag race compund for maximum street/strip traction. 704 Compound: Drag racing slick, tube type. Not DOT-certified. Extreme traction material. Race cars of 3,500 pounds or less will find this compound very effective. Light or moderate burnout recommended. #8 Compound: Drag racing slick, tube type. Not DOT-certified. Extreme traction material. Soft compound for dragster and door cars. Consistent tire, very effective with big power cars. Moderate burnout recommended. HB-11 Compound: Drag racing slick, tube type. Not DOT-certified. Extreme traction material. Smaller sizes primarily for FWD race cars but can be used with AWD or RWD. Race cars of 3,500 pounds or less will find this compound very effective. Light or moderate burnout recommended.